Project Respect is a group of youth and adults who work together to create awareness and dialogue around the issue of sexualized violence by encouraging critical thinking about its root causes – gender expectations and stereotypes, imbalances and abuses of power, and the ongoing colonization of the lands and the systems we live in. It is in this spirit of respect that we acknowledge that this is unceded Lkwungen territory. Sexualized violence is a reality in the lives of too many teens. We want to create a world where sexualized violence doesn’t happen – a world where people are free to engage in healthy, safe, and diverse relationships that are based on respect. On our website, you’ll find out tons about Project Respect, including: our approach to anti-violence work; information about our programming and community action projects; elements of our curriculum; and additional resources. We’d love to hear your feedback on the content of this site as well – let us know which parts were helpful/totally awesome, what we could improve on, and/or what other resources you’ve seen that you’ve found useful. We’re always growing and changing, and your input can shape how Project Respect will evolve in the future! Most of our content is geared to youth ages 12 and up – we also have links for anyone who may be looking for support and healing after surviving an assault. We encourage adults to browse this site and talk to youth and other adults in their lives about taking responsibility to end sexualized violence. You have the power to make change. Join us at camp this April! 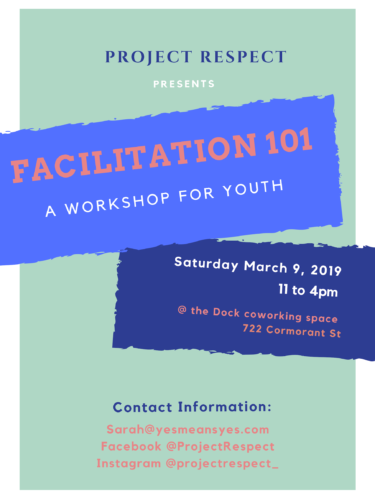 Facilitation 101: A Workshop for Youth! 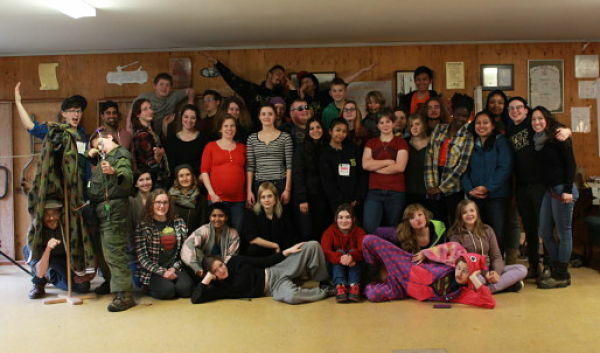 Fall Youth Social Action Camp!